Carpinteria-based Procore Technologies, company that makes cloud-based construction management software, has raised $15 million from the same Silicon Valley investors that have backed Yelp, LinkedIn and Skype. Carpinteria-based Procore Technologies, a company that makes cloud-based construction management software, has raised $15 million from the same Silicon Valley investors that have backed Yelp, LinkedIn and Skype. Procore was founded in 2003 by tech entrepreneur Tooey Courtemanche, who moved from Silicon Valley to Santa Barbara and was shocked by the pencil-and-paper process of managing the construction of his new home on the South Coast. He wrote a quick piece of code that turned into a company that now has 120 employees. Procore had 302 percent revenue growth to $4.8 million between 2009 and 2012 and made the Inc. 5000. The company raised $15 million from Bessemer Venture Partners, which has $4 billion under management and also recently invested in San Luis Obispo-based Mindbody. As part of the deal, Bessemer partner Brian Feinstein will join Procore’s board. Procore’s software lets construction professionals collaborate on projects from Internet-connected devices by keeping all the drawings, contracts and documents in one central place and synced up. Procore has been in the cloud since 2003, before it was even really called the cloud, and has cultivated a huge customer base by offering different levels of its product at prices that both small and large construction firms can afford. Procore said the funding was a Series D round. 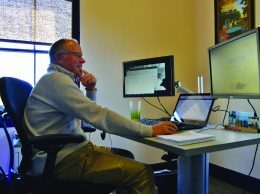 Earlier investors include Santa Barbara-based Persistence Partners, a fund formerly known as Great Pacific that includes as partners Fastclick veterans Dave Gross and Rusty Reed and Invoca co-founder Jason Spievak. It invested in Procore in late 2006.